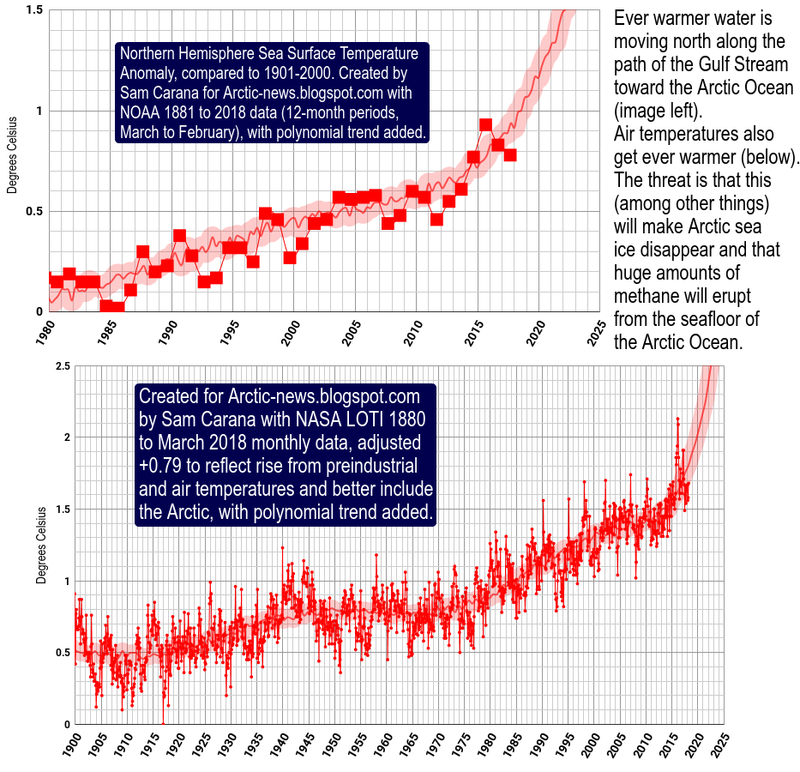 Everyone reading this most likely knows that the ice in the Arctic is melting – much faster and sooner than expected or predicted a few short years ago. Many of you may know that within only years it will all be gone during summer and that the physics of the earth system dictates that this is a truly fundamental and far reaching change for a number of reasons grounded in basic physics – albedo and latent heat to name two in particular. Some of you may also be aware of the poorly understood but potentially even more catastrophic threat posed to the earth system by methane clathrates – and a few of you may be aware of the significant and growing list of positive feedbacks that are now underway and moving closer to dramatic and abrupt step changes. We know – whether you think it will take five years or fifty years – that our interdependent and logistically complex civilization is on track to face unprecedented challenges that history teaches us have an excellent chance of destroying it. We also know that the foundations for civilization will be destroyed in the foreseeable future – the stable benign climate that nourished us for the last ten thousand years will be gone for the rest of human history if truly dramatic actions are not taken immediately. While I have some appreciation for how fundamental and serious this situation is – this is not a point I intend to dwell upon. I would like instead to talk about psychology – particularly yours. While I am sure some people who read this may be already doing extraordinary things to try to address the situation – it seems a fair assumption to me that most will not be. Too many people are satisfied to wring their hands about the hopelessness of the situation and to become absorbed by the idea of their personal powerlessness. They look to the leaders of the political and corporate worlds to protect their own interests while perhaps failing to understand that these people look after their own interests first and foremost. The person best able to look after your interests is usually – you. Too many people want to believe that a token sacrifice is enough to be able to say they did their bit to save themselves and the children of the world from hell on earth. Unfortunately using energy efficient light bulbs, recycling and offsetting carbon dioxide for flights and things is not enough to fundamentally change the situation. It is a good start and should be lauded as such – but even if everyone did these things – we are still damned – and therefore must appreciate that a greater effort is required. What I want to do is to talk about personal responsibility. The actions of the collective masses of society including corporations and politicians start with individuals. If you cannot act proportionately to the problem to look after yourself and your family if you have one – how can you expect other people to do so? My basic point therefore is that most people, even well informed people, are not acting to address the problem proportionately to the severity of the problem. My second observation is that many people immediately destroy their own chances of greater action by various excuses that they use to destroy their effectiveness before they even tried. There is no surer route to failure than to never try in the first place! If someone suggests to you that you communicate your concerns regularly to politicians and corporations by using telephones, letters and internet forums – do you start to do this or do you say that your voice is too little and that it would be a waste of time? Imagine for a moment the difference between everyone assuming it is a waste of time and countless millions of people deluging those with the power in our society with their demands? If someone suggests you go on protests and demonstrations to highlight the issue and face arrest – do you say that you can’t take that risk, implicitly saying that you do not think the cause merits it? It is easy for the authorities to arrest a few hundred people – but again – they cannot arrest millions. Do you tell people that the mess cannot be fixed and that geoengineering is bound to fail because we already made so many mistakes as a species? Do you justify ignoring the problem as you are happy to conclude it is hopeless and insoluble? If so, do you accept the idea that you are actively condemning yourself and your family and other people around you with whom you could cooperate to realize a better chance of a future – if only you stopped being defeatist from the outset? I am saying that now is an excellent time to take stock and to realize that the keys to defeat and therefore victory lie first and foremost in your own mind. I am not giving a prescription for any specific action – merely to point out that almost everyone reading these words can act more on these issues. The author of this blog (http://jasonexplorer.com/about/ ) travelled all around the world using only muscle power taking over 13 years and travelling over 46,000 miles. He started as a virtually unemployed window cleaner and made it an awe inspiring platform from which to talk about sustainability. Then there is the author of this blog (http://climate-change-action-plan.blogspot.com/ ) and many other blogs working tirelessly and without personal reward to educate and inform people. He makes sure not only to explain how serious the problem is but also to inform people of the solutions that we may still have a tiny amount of time left to implement to provide a collective hope for the billions of people living today. Finally there is the author of this blog (http://deusjuvat.wordpress.com/about/ ), who is working on a plan that tries to face the consequences of civilization failing and promoting an aspiration to ensure that even in the very worst outcomes there remain some hopes for a future for our species. This starting from a position as a minimum wage worker. I believe that the difference between an ordinary person and an extraordinary person is quite simple. In most cases it is quite simply the difference between being prepared to act and preferring to conform to the mold defined by social expectations where authority and responsibility are meekly delegated to other people. We face an extraordinary challenge and we need extraordinary people to face it. Please consider seriously – what can you do? Never underestimate what one person can do. Excellent article on getting a grip on climate change. Understanding that we are not helpless and approaching the issue with determination is a good start. Everyone not only can do more but we must do more. "I step outside and all I see are people driving around in cars and heating their houses with natural gas and flying in airplanes and lugging home big boxes from Wal*Mart in their SUVs. There is no visible group of people around me who behave as if climate science is real. Only a tiny fraction of people are able to dial back the overwhelming social consensus and use their rational thinking toolkit to examine the scientific evidence. Among those people, the consensus is that climate change is a really big deal, and to avoid some really horrible consequences that would be far worse than, say, having to learn how to enjoy yourself without airplanes, we have to cut everybody’s greenhouse gas emissions by an amount hardly anyone in a developed country will contemplate." It really is too late for us. We are interested now in coming to terms with our mortality and accepting near term extinction as inevitable. Some of us are interested in prolonging our lives until it's no longer feasible and others are investigating the appropriate time and method of debarking. Good luck. Not being helpfull Tharpa. If it comes too it, we have the 100,000 rockets and ICBMs needed for space mirrors, and if we can't stop the Arctic sea ice going, 10 years from now we'll probably be using them. As it stands now, currently the value of money is not linked toward keeping Earth alive and toward stopping her from full blown runaway global warming. It is necessary to frame a change to the value of money so that Earth's ecosystems naturally have standing in business transactions large and small and so enterprise naturally tends toward improvement and sustainable peaceful enrichment. 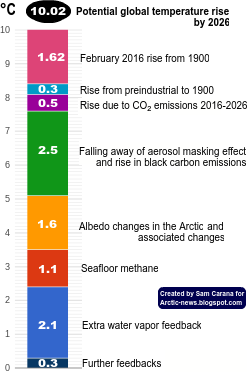 Arctic News Blog here and Arctic Methane Emergency Group along with internet access allow people to learn things and interject thoughts.. Anyone can. It looks like Earth has passed a turning point that will be hard to undo. I'm estimating it will take full employment in best manner possible to do it. Allocation of resources to what best serves the common good and all PEOPLE alive. It seems to me that this psychological attitude of apathy defeatism or even we brought it on ourselves and the planet would be better off without us, is as big a problem as the problem itself.